I’ll have to check my Aldi’s tomorrow! Those are great prices, too! The cheapest I’ve seen on green bell peppers here is .99 each. Red and yellow are $2 each! I wonder if Aldi’s ever came our way if we would see produce prices like these. We love ALDI for their produce. The only thing is that you usually have to let things like pears and avocados ripen more, but that’s not bad. I love it when strawberries and pears are such a good deal! We bought mangos a few weeks ago there and had to let them ripen a bit more, but at the price they were offering, it was so worth it. Everywhere else, the best price is 99 cents each. And I will not buy butter anywhere else any longer! Crystal, every time you share your Aldi loads, I miss having one nearby. When we lived in Birmingham most recently, I used to save tons between Aldi trips and Publix specials. I don’t have that kind of thing in Houston, sadly. Great deals!! All the people who were leaving not so kind comments on yesterdays guest post should check out these great prices on very healthy foods! It can be done! Couponing is not just for junk food. Thanks for all you do! You are an encouragement to many! Thanks for the info!! For anyone living in Wi, Mn, or iowa kwik trip is still having their butter blowout-only 1.69 a pound and gallons of milk are only 2.29 untl the end of may!! In bags, I should add. 29 cents for avocados!??!?! I paid $.89 on sale which is about as low as they’ll go in Va Beach. 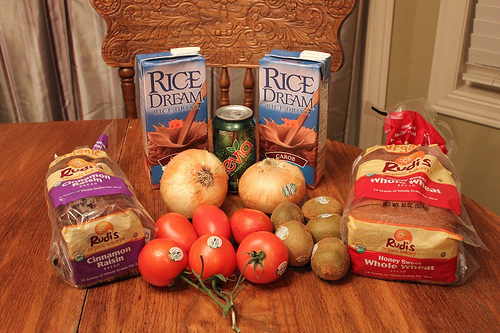 At that price, I’d eat this healthy food all the time! I am salivating at the site of those strawberries! Its not strawberry season where I live (Western Australia) so they are currently $3.99AUD for half the size you have pictured, and they mold within a day (if they aren’t already). Needless to say, we’re living off the in-season produce of apples and pears and apples and pears (for the next 5 months). Its amazing the combinations of snacks you can make with apples and pears. Have fun meeting all your readers! Having total avacodo envy! Great prices. I recently started shopping at Aldi again and I forgot how great the produce prices are! Our avocados are 49 cents here this week but I am still super happy about it. Coupons are for junk foods most of the time etc… but there are jewels every once in a while. And if someone has the time to make clipping coupons a full time job- they can save the loads of money that you post. I have 2 jobs and a family- so I do what I can to save. I work at Trader Joe’s (not the same owner as Aldi’s- but they are brothers). A lot of the time, the produce (at Aldi’s) is the exact same as what Trader Joe’s is selling- but for a lot less! I love the produce at Aldi’s- and feel better knowing that other stores sell the same! Crystal, can you share more information about the 2 coupons from Jessica? I went to her website but did not see any coupons. I’m going to have to check the Aldi flyer online today and price match with Wal-Mart since I’ll be near a Wal-Mart today. Thanks for sharing. Jessica is a friend of mine and she gave them to me when I saw her in California in March. I wish there was a way everyone could sign up for them! I love Aldi’s produce! 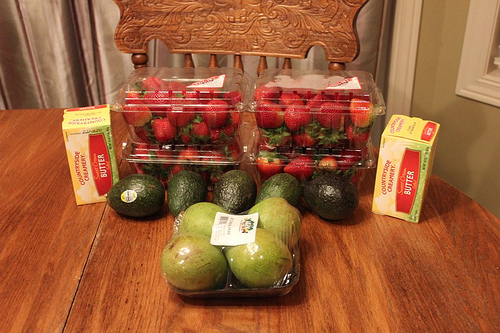 My kids eat so much fruit, and thanks to Aldi, I can stay in our grocery budget. Their prices on milk and other staples are wonderful, too! How do you like Aldi’s other products? They have brands I have never heard of. They ave popped up every where here in the Orlando area and I just wasn’t sure how they were. I guess I will have to try because the prices are amazing! A lot of those like fit and active are their store brand. I like most of them, here are a few that I have tried. -Graham crackers, too much wheat? I shop primarily at Aldi, and we’ve liked almost all of their store-brand products that we’ve tried. Wow! .29 for avocado! In Cali we can get teeny tiny ones for $1 sometimes but mostly 2/$3. Jealousy over here!! What r u going to do w the strawberries n kiwi? That’s some Cindo De Mayo sale on avacadoes! They are .79 here at one place and .97 at another (usually the lowest is .97 on sale anywhere). This post makes me want to move back to the States!!! How much is the Rice Milk normally? We pay $3.89 here, but we didn’t use it before we moved, so I’m curious what the price is. I wish avocados were so cheap here. They sell for $1 each in our area. I can’t believe it. $0.29 for an avacado? I’ve paid up to $1.50 each in the past at other stores. I’m hitting Aldi’s soon. Our Aldi is in my back yard. It is unbelievable the crowds and all the food that is bought. It really blows me away. Every Sunday am my Aldi has fresh fruit truck come so we always head over right after church. They just had pretty baskets of hanging flowers for 5.99 last week. If I am not there first thing everything is gone. I live within 1 mile of all major grocery store chains. Right across the street is a grocery store that is 4x as much as Aldi. I am so addicted that I get a rush every time we go. Sounds crazy. The price of all dairy should be going down in the next little bit, my dad is a dairy farmer, when his price goes down it takes a few weeks but then the store price will go down, So happy hunting on the good dairy deals. We finally got an Aldi’s in the town where I live, and I am thrilled! There is one in the town where I work, but to go there took advance planning and was kind of inconvenient. Now it’s on my way home! As many others have said, check out their produce prices. The “regular” grocery store has avocados for $2.79 EACH, where Aldi had them for $.49. I lived in Mexico for a long time, and am ecstatic that I can cook like we did there but now here, all on a budget. Milk is usually slightly cheaper at Costco, but not by much. We have liked almost everything that we have purchased from Aldi, and now buy almost everything there or at Costco. I still watch sales and use coupons for the occasional item, but it seems like the coupon deals have gotten much more sparse compared to two-three years ago.